Featured on Food Network, Peanut Butter Wings® are the taste sensation everyone is talking about! These one-of-a-kind taste sensations use crisp, rippled potato chips smothered in creamy peanut butter and covered in gourmet dark chocolate. 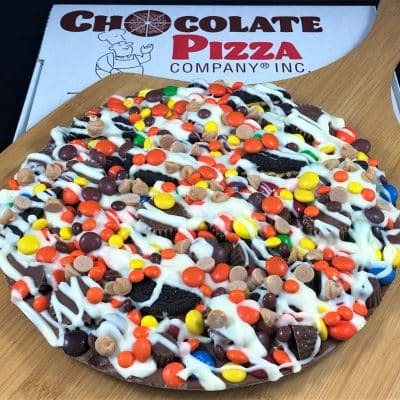 One of our best-selling products and the perfect complement to our famous Chocolate Pizza®. Sealed in cellophane (8 oz). There’s peanut butter and jelly, peanut butter and bananas, peanut butter smoothies but they all play second fiddle to the confectionary giant we call, Peanut Butter Wings. If dark chocolate is your favorite, then relax, you’ve discovered your new favorite treat. Peanut Butter Wings are so unique they’re trademarked and dark Peanut Butter Wings are so delicious they should come with a warning label that you can’t eat just one. 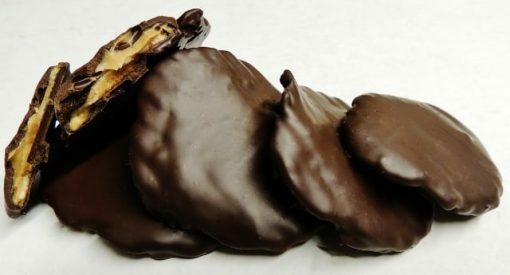 We take crisp, rippled potato chips, cover them in creamy peanut butter and run them under a curtain of gourmet dark chocolate. It’s a salty-sweet combo that has been featured on Food Network, ABC News and other major media. The chip gives you crunch, the peanut butter is salty goodness and the dark chocolate is smooth sweetness. Taste one and you’ll never look at dark chocolate and peanut butter the same again. And to top it off, we make this masterpiece by hand – one at a time. Yep, Dark Peanut Butter Wings are not mass-produced. This is edible genius. Our chocolatiers spread peanut butter on every chip before placing it on a conveyor that takes it for a ride through a chocolate curtain and down a long, dark cooling tunnel where it emerges ready to make your day. 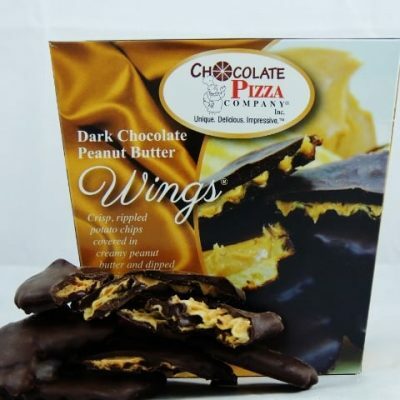 Peanut Butter Wings are packed in regular 8 ounces or large 16 ounces and come in milk or dark chocolate. No matter what flavor you choose or what size, one thing is certain … you are in for a magical taste ride that you’ll want to enjoy and share with family, friends and colleagues. 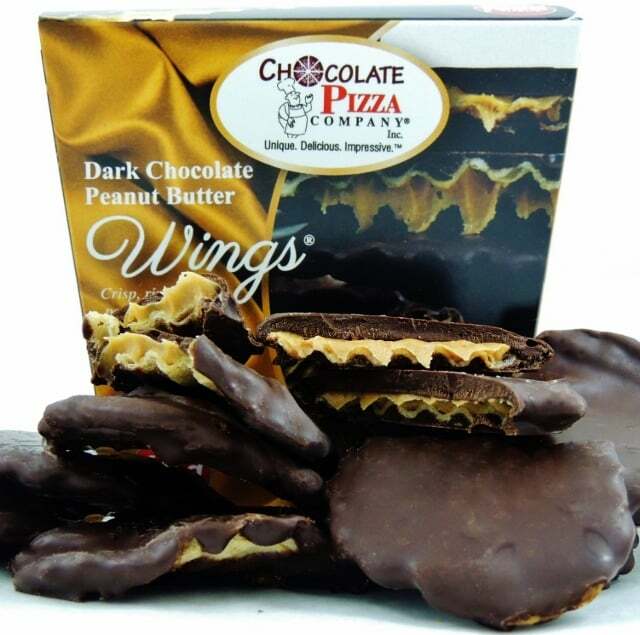 Dark Peanut Butter Wings are the second half of our famous “Pizza and Wings.” They complement our Chocolate Pizza and together create a gift combination that is an easy choice. 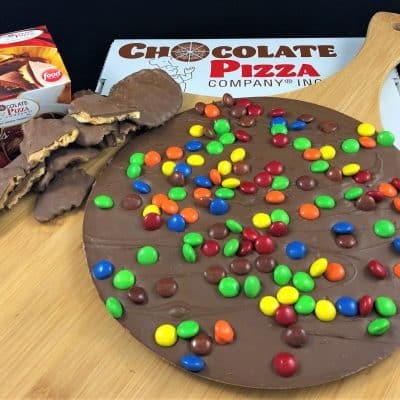 But whether you choose a “Pizza and Wings Combo” or just want to enjoy the Peanut Butter Wings by themselves, this is a special treat that everyone loves.